The latest reviewed version was checked on 25 January 2018. There is 1 pending change awaiting review. Liquids have some intermolecular bonding, but it isn't as strong as bonding in a solid. As a result, the molecules are close together, but they are not tightly packed. Instead, they are free to slide past each other. Liquids occur at temperatures above the melting point of a substance, but below its boiling point. At the melting point, the molecules are moving slow enough to form rigid bonds and become a solid. At the boiling point, the molecules are moving so fast that they cannot form any bonds and become a gas. Diffusion is the chaotic mixing of fluids. The jar on the left has warmer water. Liquids have definite volume, but indefinite shape. They are free to form droplets and puddles when they are not inside a container. When a liquid is inside a container, it will take its shape. Unlike gases, a liquid will not change its volume to spread out and completely fill a container. There is enough intermolecular bonding to give liquids a definite volume. Liquids are fluid, able to flow and take any shape. This occurs due to the weak intermolecular bonding that allows the molecules to slide past each other freely. As a result of being fluid, liquids exhibit many interesting properties that solids do not, including capillary action and diffusion. Liquids, like gases, undergo diffusion when mixed. This can be seen by adding food coloring to water. Different liquids, when added, will chaotically spread out and mix together. Diffusion will occur faster when the liquid is warmer because the increased kinetic energy allows the molecules to move faster and collide more frequently. Liquids are usually considered incompressible. The molecules are already close together, so it is difficult to compress them any more. Under very high pressures, liquids will actually compress, but not very much. Liquids, unlike gases, have a distinct surface—they need not take their container's shape. This allows the formation of droplets and puddles. 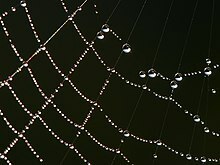 Water droplets adhere to a spiderweb. Their round shape is caused by cohesion. The molecules of a liquid are attracted to each other. This is called cohesion. Molecules like methane are non-polar, so they are held together only by van der Waals forces. These molecules will have minimal cohesion. In contrast, water molecules use hydrogen bonding, so they display strong cohesion. A cohesive liquid will form more spherical droplets and have much higher surface tension. Adhesion is the attraction of a liquid molecule to its surroundings. Adhesive liquids will demonstrate capillary action. They are also more "wet". Mercury is very cohesive, but not adhesive. As a result, it doesn't leave behind residue as it rolls across a surface. Water, on the other hand, is much more adhesive. When water rolls across a surface, it wets that surface because some of the molecules adhere to it. When water drops are on an impermeable (waterproof) surface, they tend to form beads. This is due to its surface tension. Liquid molecules pull at each other, and as a result they decrease their surface area. The molecules at the boundary of the liquid are pulled in, causing a droplet shape. When water is on a permeable surface, it spreads out, as can be seen with water on a paper towel. This capillary action explains how water in the ground reaches the top of trees that are hundreds of feet tall. Adhesive liquids (like water but not mercury) will rise up a narrow tube. Cohesive liquids have surface tension to hold themselves into droplets. Liquids will distribute pressure evenly. This concept, known as Pascal's Law, is crucial for equipment like hydraulic brakes. It is a result of their incompressibility. If there is no atmospheric pressure (a vacuum, like outer space), liquids cannot form. Liquids will evaporate. Although the average kinetic energy of the molecules is too low to overcome bonding and become a gas, individual molecules will occasionally have above-average energy and break free from the surface of the liquid. The molecule then escapes to the gas phase. At the same time, however, a gas molecule may hit the surface of the liquid and slow down enough to join the liquid. A glass of water left outside in the sun will eventually become empty. The sunlight adds energy to the molecules, allowing some to escape as a gas. Eventually, all molecules will escape. The tendency of a liquid to evaporate depends on its intermolecular forces. Volatile liquids tend to evaporate quickly have relatively weak intermolecular forces keeping the molecules together, making it easier for them to escape the liquid phase. Conversely, non-volatile liquids do not evaporate to any visible extent due to the presence very strong intermolecular forces. The evaporation increases with temperature. It can be measured by vapor pressure, the amount of pressure exerted by the evaporated gas above the liquid's surface. Vapor pressure increases with temperature, and once it reaches the pressure of the surrounding atmosphere, the liquid will boil. Vapor pressure also depends on the intensity of intermolecular forces in the liquid. Viscosity refers to the liquid's resistance to flow. For example, maple syrup has a relatively high viscosity when compared to water because maple syrup flows much slower than water, which flows relatively quickly and easily. The difference in viscosity between these two liquids is due to the attractive forces within the specific liquid. In order to flow, molecules must roll and move over each other. A solution with low attractive forces would allow the molecules to move in a more free and easy manner, decreasing the viscosity. In most cases, the viscosity of a liquid decreases as the temperature of a liquid is increased. Increasing the temperature of a liquid causes the molecules to have a higher kinetic energy. This increase in kinetic energy breaks down the intermolecular forces present in the liquid. Since viscosity is dependent on these attractive forces, the viscosity will decrease when the kinetic energy is increased.